The Nieuport 28 was the last of a line of fighting biplanes to see combat service in the First World War. Unlike all of its predecessors, which had been sesquiplanes (a two-winged airplane in which the lower wing is less than 50% the area of the upper wing), this was a single-bay biplane. It is considered one of the most aesthetically-beautiful airplanes to serve in the Great War. Design of the Nieuport 28 began in the summer and fall of 1917, as Nieuport was determined to create the successor to its successful Nieuport 17, 24 and 25 fighting scouts, which were now showing their age in competition with the Albatros D.V and the new Fokker Triplane. The SPAD VII, which had been the main competition for the earlier Nieuports had a higher top speed and an ability to outdive the lightly-loaded rotary-powered sesquiplanes, and was set to be replaced in production by the SPAD XIII as the main fighting scout of the French Air Force. One of four new prototypes that first flew in November 1916, the Nieuport 28 was powered by a 160 h.p. Gnome-Rhone Monosoupape 9N rotary, and was to be armed with two Vickers .30 caliber machine guns mounted on the forward fuselage and firing through the propeller. While the Ni.28-C1 more than met the specifications issued, it was outclassed by the SPAD XIII that flew a few weeks later, and was recommended as the sole fighter for the French Air Force for 1917. As it turned out, production schedules fell so far behind that the SPAD XIII.C-1 did not enter widespread service until early 1918. Having been rejected by its own national air force, the career of the Nieuport 28 should have been finished, but the entry of the United States into the First World War in April 1917 changed everything. The aircraft industry of the United States was so far behind contemporary European developments that there were no domestic designs that could be produced for combat service, and the aircraft industry was busy deciding which foreign designs would be manufactured in America. The Nieuport factory was winding down production of the sesquiplanes, and had excess capacity. The Nieuport 28.C-1 was “good enough” as a design to have met the minimum requirements of the French Air Force. Force Majeure stepped in to decide that the little Nieuport would become the first fighting scout of the new United States Army Air Service. By March, 1918, as American flying personnel finished their training in the United States and France, 297 Nieuport 28s were transferred to the U.S.A.S. and became the initial equipment of the 94th and 95th Aero Squadrons. Initially, the airplanes were delivered without armament, due to shortages of Vickers machine guns, and in fact most of the airplanes flown by the two American units only carried one machine gun until shortly before they were re-equipped with the SPAD XIII in the late summer of 1918; even then, many pilots retained only the single weapon, as the weight of two guns had a deleterious effect on performance. The 94th “Hat in the Ring” squadron (the insignia represented Uncle Sam’s hat “thrown into the ring” of combat) was commanded by Lafayette Flying Corps ace Major Raoul Lufbery, who managed to transmit what he had learned in two years of combat over the Western Front to such untried Americans as Douglas Campbell, Alan Winslow and Eddie Rickenbacker. Rickenbacker, Campbell and Winslow accompanied Lufbery on the first combat air patrol over enemy lines on March 19th, 1918. Several more patrols were flown by other members of the unit during the course of the rest of the month and early April, without major combat occurring. On April 14th, Campbell and Winslow shot down two German observation airplanes, the first victories by Americans flying in the American Air Service of the First World War. Eddie Rickenbacker, who was famous in America before the war as a race car driver, and had come to France as chauffeur for General “Black Jack” Pershing, commander of the American Expeditionary Force, was older than his comrades when he managed to convince his boss the General to approve his transfer to the Air Service. He took his flight training under the French at Issoudun, as had both Campbell and Winslow and the other original members of the 94th, who had all enlisted shortly after the U.S. entry into the war and been sent to France for training since the U.S.A.S. was still setting up its flight schools. Rickenbacker scored his first victory on April 29th over an Albatros D.V, and his fifth on May 30th, 1918, to be recognized as America’s second ace. He very nearly did not survive to make that fifth kill; in combat a week previous, he put his airplane in a dive to escape the enemy, and the fabric on the upper surface of the right wing came loose and tore off. The Nieuport 28 had a nasty habit of doing this if a pilot dived too fast, and Rickenbacker was the only pilot to survive the event, managing to bring the airplane in to a “hot” landing at Tours field despite losing half of his upper wing, in a demonstration of flying skill that singled him out as being head and shoulders above the others in regard to ability. Shortly after his fifth victory, an ear infection sent him to the hospital for four months, and he did not return to operations until the latter part of September 1918, just in time to participate in the Meuse-Argonne Offensive, America’s contribution to victory over Germany in 1918. In six weeks of almost-daily combat, Rickenbacker scored an additional 21 official victories (he may have scored twice that number) while rising to lead the 94th Aero Squadron. Such performance clearly demonstrated he was worthy to be considered alongside Mannock and McCudden, Guynemer and Nungesser, or Richtofen and Udet as one of the truly great combat pilots of the First World War. The first 1/48 scale Nieuport 28 plastic model was released by Aurora in the fall of 1957 (I clearly recall convincing my mother to let me buy one while we were out shopping for back-to-school supplies). This kit - which was later re-released in the 1990s by Glencoe - provided a good approximation of the beautiful lines of the original, but left a lot to be desired. Blue Max came out with a limited-run kit of the airplane in about 1998, and this was the gold-standard for 1/48 Nieuport 28s for those lucky enough to have bought one of the 1,500 kits produced. This new kit by Roden effectively takes that title away from the Blue Max kit. 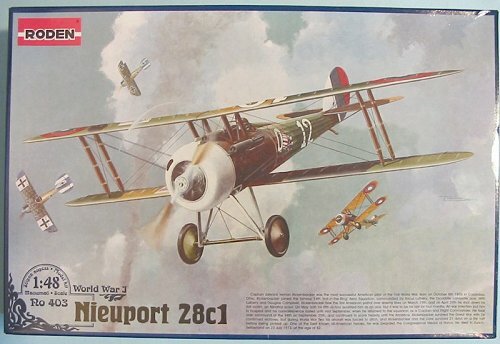 It is not only the best Nieuport 28 kit available in 1/48 scale, but one of the very best World War I kits I have yet seen. The kit is the essence of simplicity, with only two sprues of parts and only ten main parts, yet it provides an excellent cockpit interior, and has the thinnest wings and tail surfaces I have ever seen produced in a plastic World War I kit. These wings are so thin (and so right by so being) that they make the wings on the Blue Max kit look like they were for some internally-braced Fokker product. The surface detail on the wings and fuselage is superb, with just a hint of “hills and valleys” on the wing surfaces, and with the fabric on the rear fuselage stretched tight and flat the way it was on the original. The two Vickers machine guns are beautifully molded; Roden has a reputation of “getting it right” on the machine guns in their kits, and they have maintained the reputation here. The engine is also well-represented, as is the difficult-to-mold deep cowl. Some other WW1 modelers have said they think the colors of the national insignia in the decals is suspect, but I will disagree. The colors are intense, and I think they are right. I would suggest that a modeler take one of the numeral decals they are not planning to use and test it in the water to see if it stays together when it comes off the backing sheet. Some Roden decals have been known to shatter - so if that happens with your test specimen, give the rest of the sheet a thin coat of Future and the decals should be useable. The kit also supplies two Liberty Bond posters as stickers; this has allowed them to very faithfully reproduce the artwork of the original full-size posters, and the final result should realistically reproduce the look of these thick posters that were doped on the wings of the airplanes. If you have been thinking of trying your hand at building a World War I model, here is the kit for you! 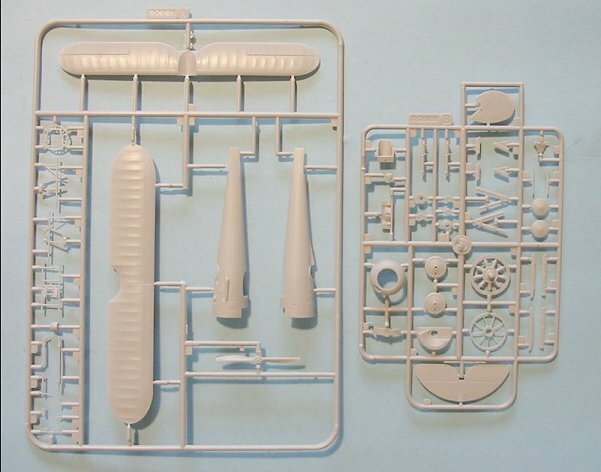 The kit requires only simple rigging, which should not scare off a newcomer, while the production quality of the parts is excellent and the production design of the kit is as good as anything from Tamiya - you could call this kit of the Nieuport 28 the “Tamiya Mustang” of World War I models. I know for a fact there will be more than one of these show up on my World War I shelves. This beautiful kit goes to the top of the “to-do” pile. Thanks to Roden for the review copy.